Field-proven HOBO reliability with the convenience of wireless. 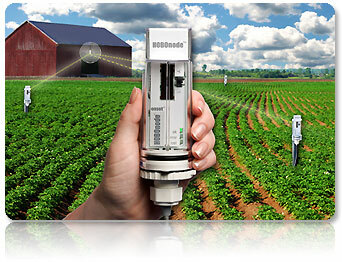 HOBOnode wireless sensors monitor temperature and soil moisture conditions and transmit the data back to your computer. They enable you to view current conditions through a remote sensor, receive alarm notifications, and log data on your PC without having to run cables through the field. Accompanying software provides alarm notifications to your cell phone, e-mail, or PC. 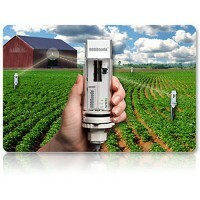 Ideal for frost alarms, agricultural research, crop management, and more. Fast, easy deployment - HOBOnode wireless sensors can be deployed in a matter of minutes. Featuring integrated, solar-rechargeable batteries, the sensors' compact design makes it easy to deploy them in nearly any type of field location. All it takes to get started is a HOBOnode Sensor, Receiver, and HOBOnode Viewer Utility Software (Free Download). 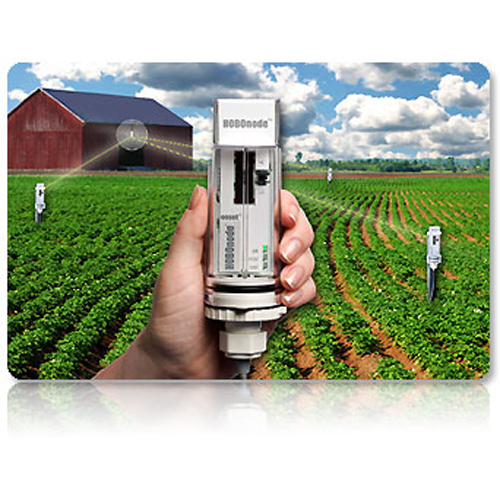 The HOBOnode Viewer Utility - Provides sensor set up and readout functions, and displays real-time graphs of temperature and soil moisture conditions. Data can be exported for use in the HOBOware Pro data logging software, spreadsheets and other programs. Get notified - The HOBOnode Viewer Utility can be easily configured to provide alarm notifications when temperature and/or soil moisture conditions exceed set thresholds. A loud audible alarm can be set for your PC, or you can have alarm notifications sent directly to your cell phone. HOBOnode Network - HOBOnode wireless sensors make it easy and affordable to set up an entire remote sensor network, and add sensors when additional data points are needed. Up to 50 sensors can be used in a HOBOnode network. To simplify the set-up process, the “AutoSearch” feature in the Utility software finds any remote sensors in the field and automatically links them to the network. note that the HOBOnodes should not be mounted on metal poles.